Built upon an ethos of authenticity, originality, simplicity and effectiveness, Jack Black is the ideal skincare range for men who want immediate, no-nonsense results. Every aspect of the male form is cared for, and every taste is catered to. From the intensive Protein Booster Skin Serum to the humble Clean Formula Face Bar, Jack Black has is ideal for all men, regardless of the level of investment they have in their skincare regime. Notable products are the best-selling Intense Therapy Lip Balm with its SPF of 25 and the entire Hand & Body range, which includes a collection of products that enhance exercise both pre and post workout. 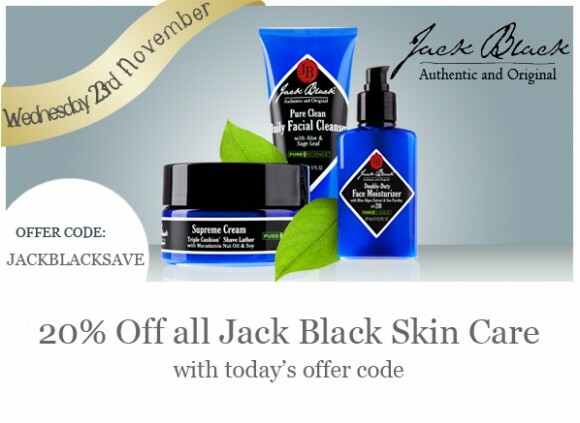 Take a look at the entire Jack Black range right here at Escentual.com, and enjoy 20% off all products for today only! This entry was posted on Wednesday, November 23rd, 2011 at 8:00 am and is filed under Christmas, Gifts, Offers. You can follow any responses to this entry through the RSS 2.0 feed. You can skip to the end and leave a response. Pinging is currently not allowed.